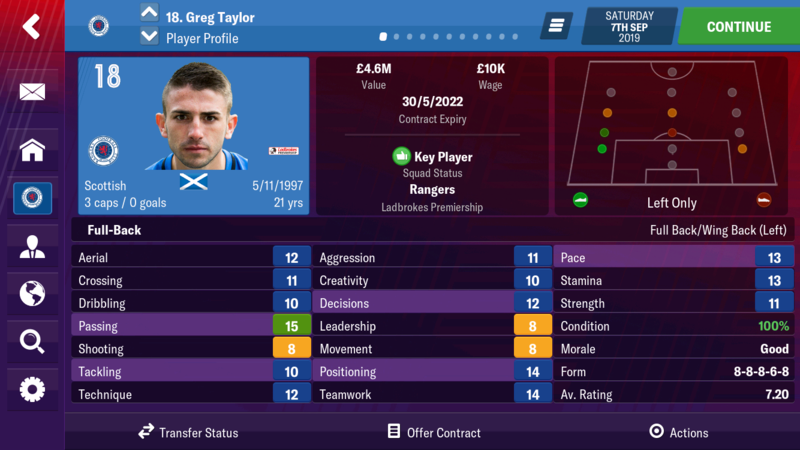 This career will follow my journey with Glasgow Rangers, the club I have supported since I was born. My time as a supporter has had it’s high and lows. In the 90’s when I was born, Rangers won 9 league titles in a row. 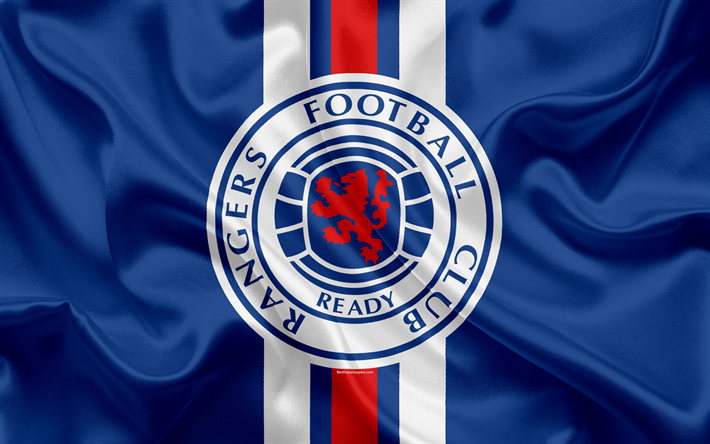 That team has lived on in the memory of Rangers fans and built a certain level of expectation. 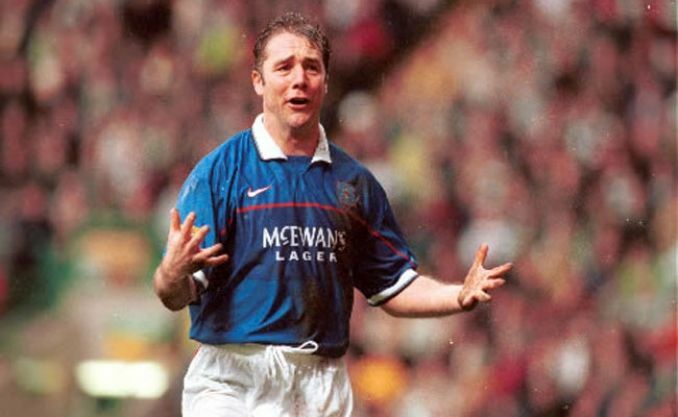 My dad even named me after Alistair(Ally) McCoist, Rangers all time top goalscorer. Whilst the current crop of players is no match for those legends, the fans still expect trophies and will not settle for second best to anyone... especially Celtic. 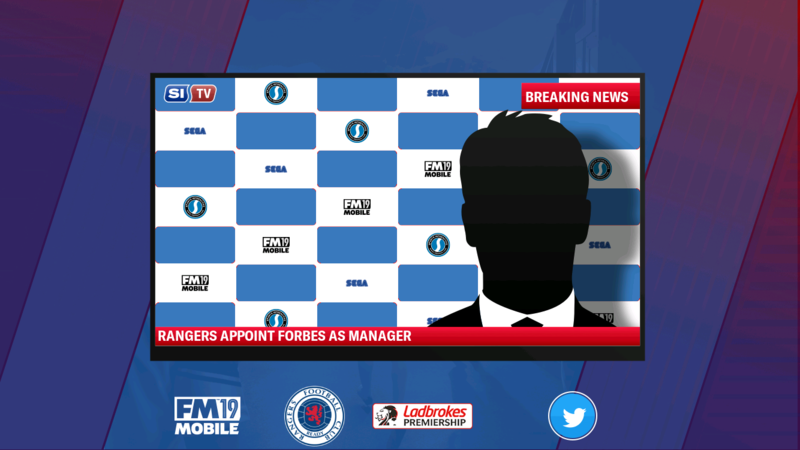 Even as a virtual football manager, I will not accept this either and will be pushing to win every trophy possible. Celtic have a vastly superior squad and finances but over time I hope to overturn this and make us the dominant force, we once were. You always have clubs like Aberdeen, Hearts, Hibs and Kilmarnock that make the league a lot more competitive than it once was. My next post will focus on the strict philosophies I will be following, tactical approach and signing policy. This is my dream job... which means every click of a button will mean something... every signing key to my long-term plans! The Mourinho approach is out of the question as we don’t have the money to buy success. 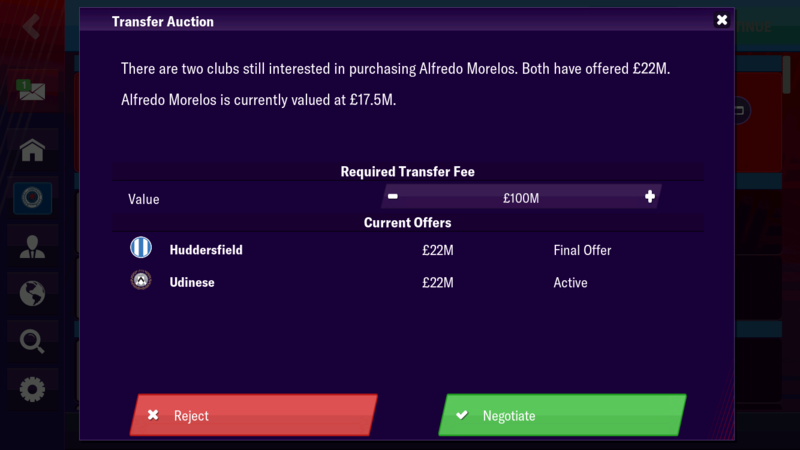 This means I need to be sensible in the transfer market. 1) Only signing players that I’m confident will become a club legend or be sold on for a profit in years to come. 2) Developing the young players already at the club. Either to step up to the first team or be sold for a fee reflective of their ability. We have seen many sides follow this style across the years, most notably at Porto & Ajax. I hope to develop even more top players than those sides, but until I get playing I won’t know how realistic this is. My focus will be on players who are under the age of 24, the younger the better as I have more time to nurture their talent and shape them as players. Thanks for the support lads! I want to dominate domestically as well as having a successful European run. 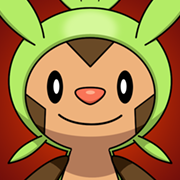 To do this I will need to have different systems I can use, depending on the opposition. Now that you are clear on my managerial style and tactics, let’s discuss the challenges I have set myself for this save. The title says it all, I have to take one player and score 1000 goals. John Greig, a defender, made 755 appearances for Rangers in all competitions. The challenge will be for one of my defenders to exceed 755 appearances. The biggest obstacle for this challenge will be keeping hold of these players. 1k baybeeee!! Ballsy move getting a player that’s 22 years old to attempt it, means you have to hit the ground running. 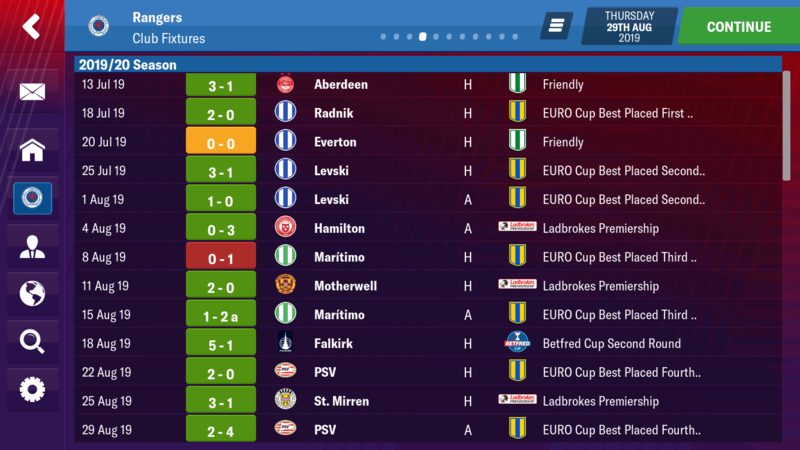 Goals should come easy enough in Scotland mind, good luck! Thanks man. He’s a great player! Need to fight off interest from the Premier League to keep him. That’s exactly it... stop their bid for 10 in a row and start my own. I want to stop the trend. The last three Rangers managers have went with the ‘buy buy buy’ policy. This has led to us having a massive squad. 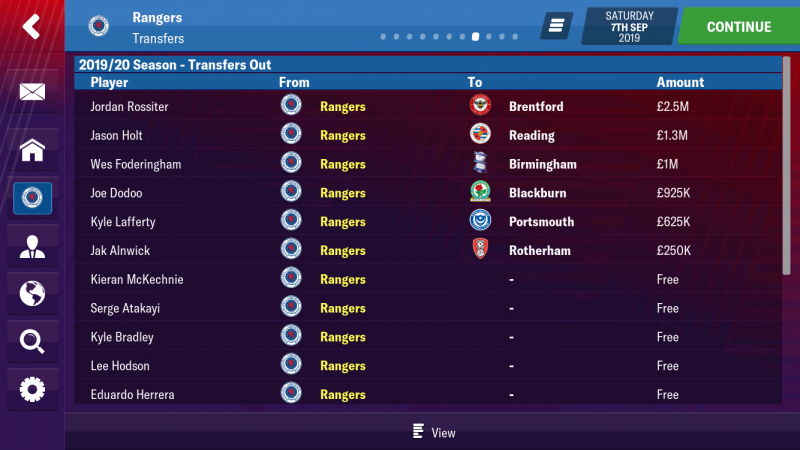 Upon looking at the first team squad, you’d barely notice, but as soon as you look at the reserves, the problem shows. 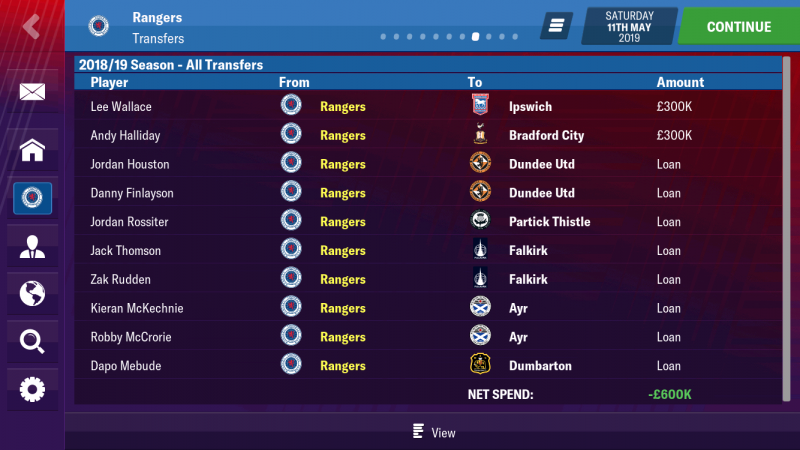 We have a large number of players out on loan at other clubs. They will all return in January/June and send my wage budget into a decline. Basically... until I get rid of the deadwood and secure our bank balance, I won’t be spending a penny. Carlos Pena below is a clear example of this. He returned in January, is on 24K a week and is hopeless at football. Transfer page's looking good. Sometimes what a squad needs is a good clean-up. Nice work. Looking forward to this. Goodluck! At the time of writing this career, I had already played my first season. 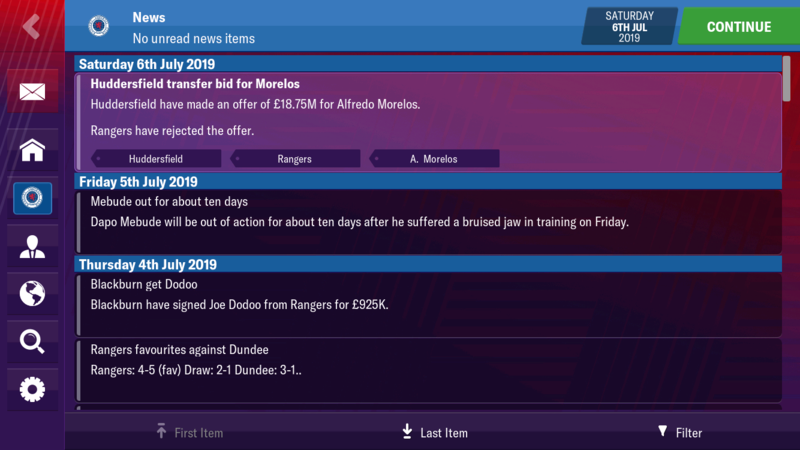 I felt that the first season was always going to be about me getting to grips with FMM19. Going forward I will be posting at least three updates per season. 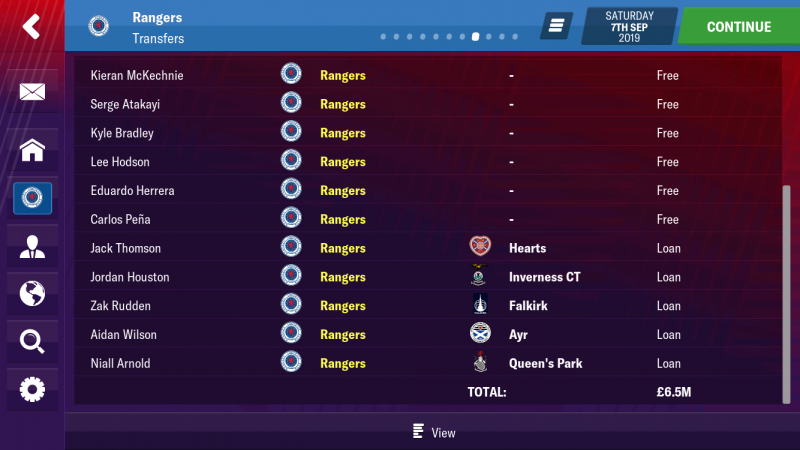 For now though... let’s review my first season with Glasgow Rangers. 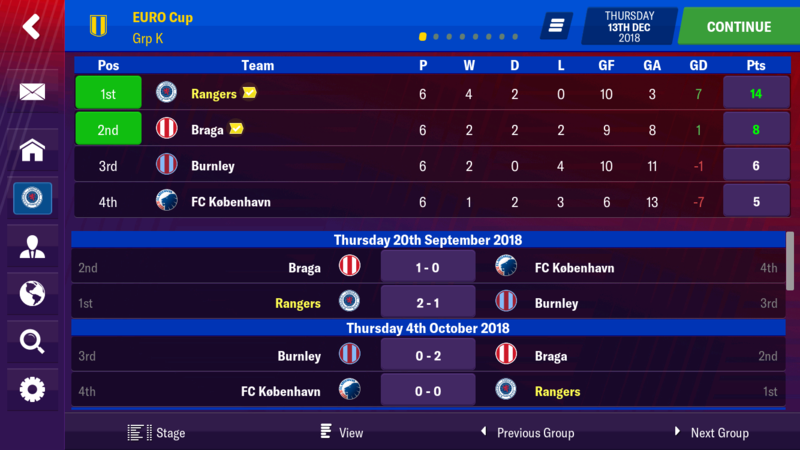 We topped Europa League Group K. Going unbeaten with 4 wins and 2 draws. 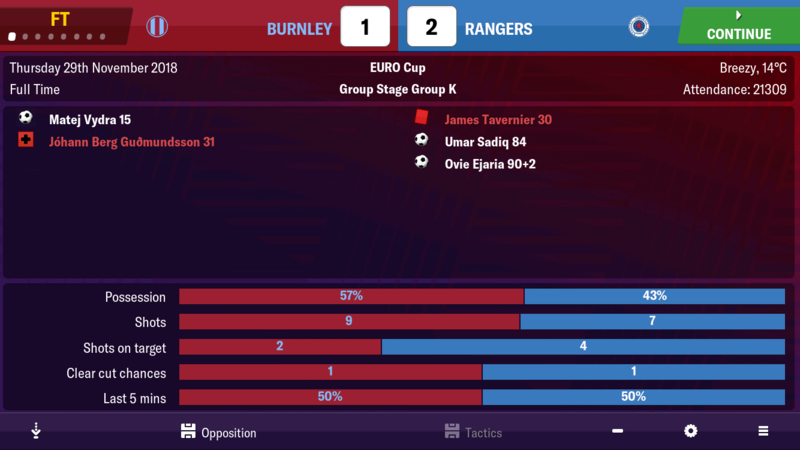 My favourite victory was this 2-1 win away to Burnley... with 10 men. 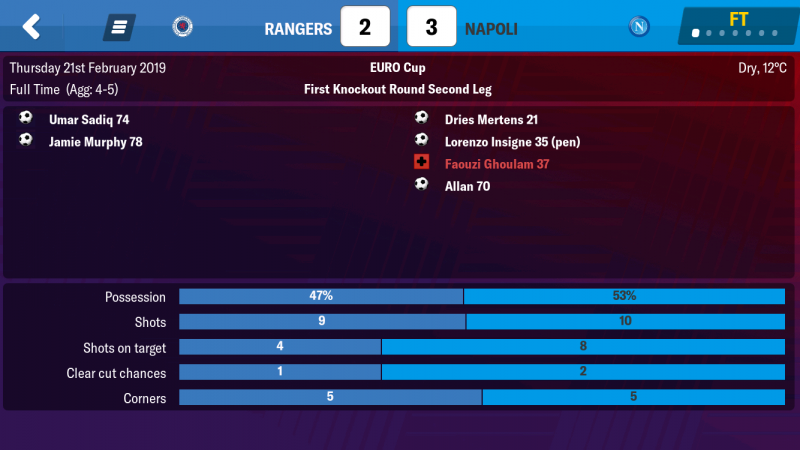 After an excellent 2-2 draw away, Napoli were too dominant for us at Ibrox. I will upload part two tomorrow.. which will let you know how we got on in the league. Could we halt Celtic? Or were they just out of our reach? I’ll also update you on El Bufalo and his battle for the 1K. 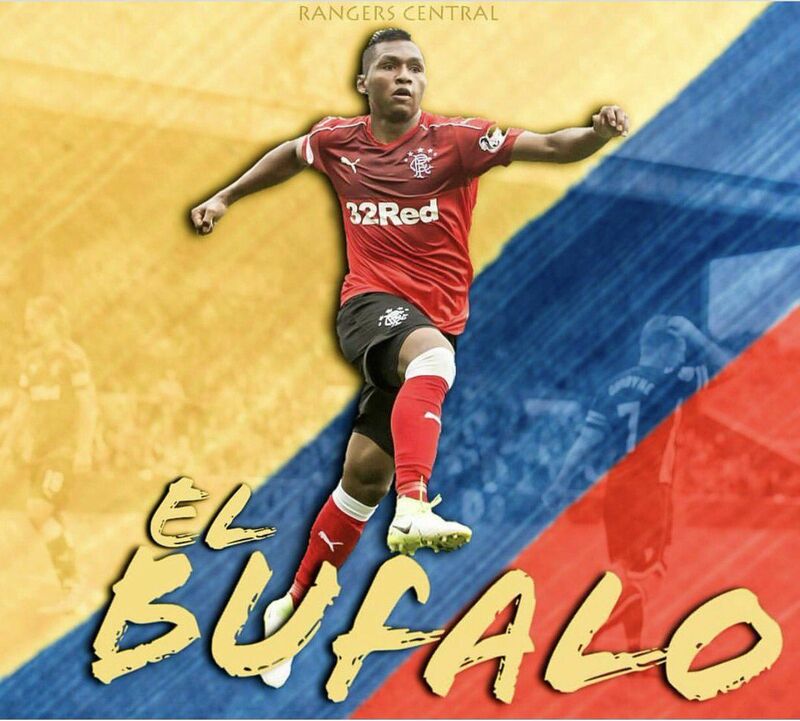 Good going winning the Betfred Cup a nice solid win you were really unlucky against Napoli, can’t wait to see ‘El Buffalo’ get 40+ goals this season haha. I also use a 4-3-2-1 with the exact same roles for the front 3 (IF-W-CF), good luck on the 1KC! Cheers for the support man. 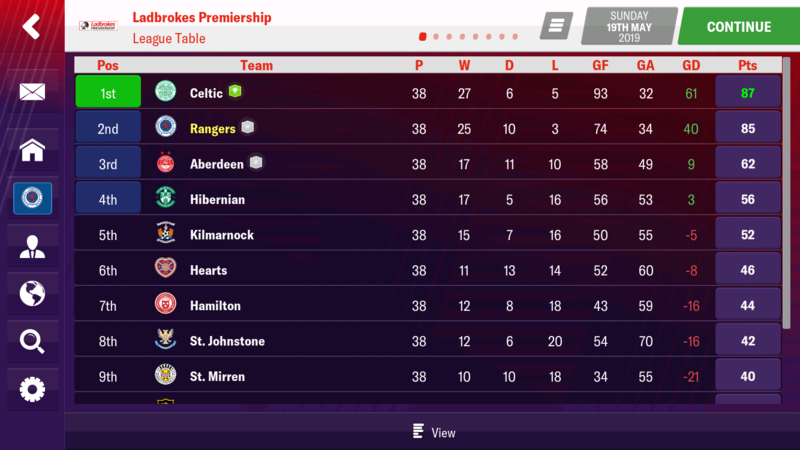 We were in a title race, something Rangers teams haven’t been in recent years. However, we fell just short of becoming champions. Two points separated us and Celtic, we were miles ahead of everyone else. I was gutted but at the same time... it’s made me even more determined to succeed next season. 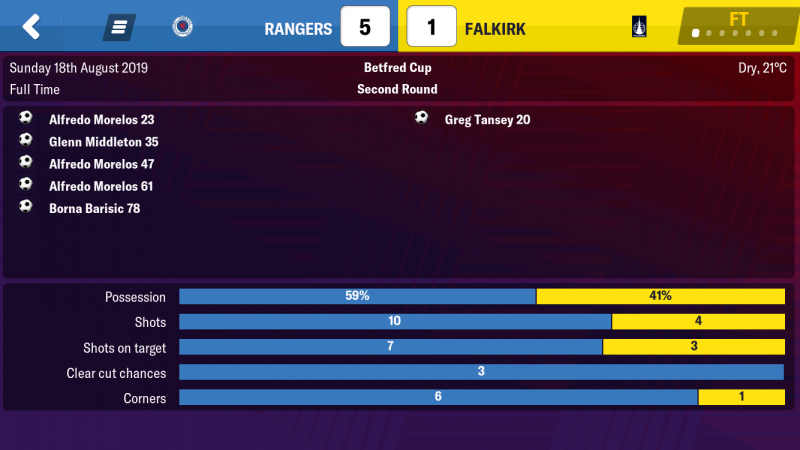 We played a crucial old firm derby, away to Celtic on game week 37. If we had won this game... we would have the league... but unfortunately we could only draw. We tend to play well in big games but struggled against lower table clubs, regularly drawing 0-0 in these type of matches. It’s time to get back to the drawing board, adapt my tactics for next season, and go win the title. 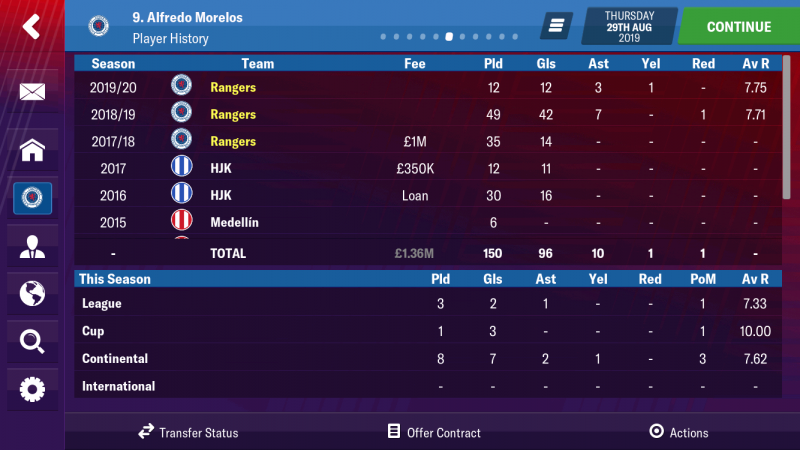 A solid start to the 1K as Morelos scores 42 goals in 49 matches. 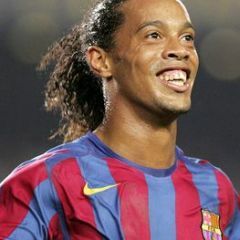 I know that he can do better and I have every faith that he can exceed 50 goals next season. 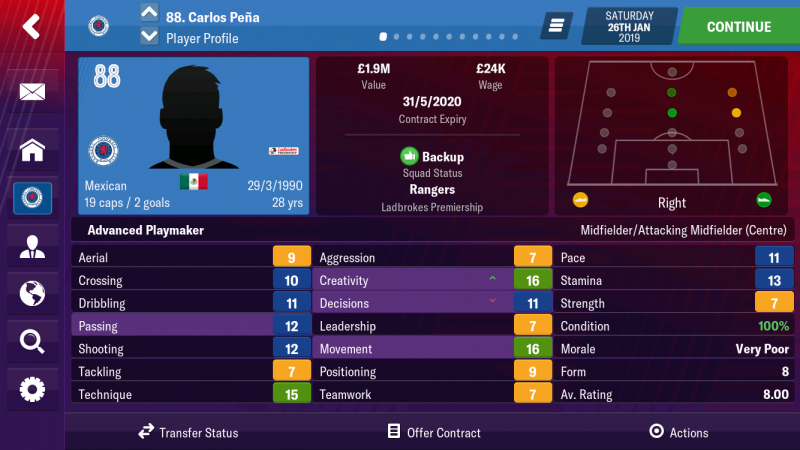 He is playing as a CF which best suits his attributes. Premier League clubs have been trying to unsettle him all season. I rejected the below bid from Huddersfield and will continue to do so... he’s our main man and key to the challenge. SEASON TWO - STRONG START. I knew my squad had potential to achieve greater things this season. I have a very young group of players who are improving, day in day out. A terrific start to the season! We once again reach the group stages of the Europa League. Morelos is looking clinical this season, he’s ruthless and striving for that 1K. 12 goals in 12 games, cannot complain. 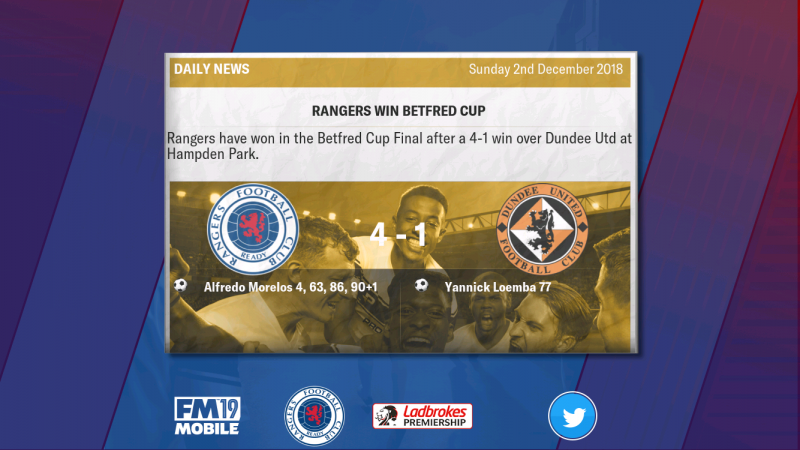 We won the Betfred Cup last season, no surprises our biggest win of the season so far... comes in this competition. 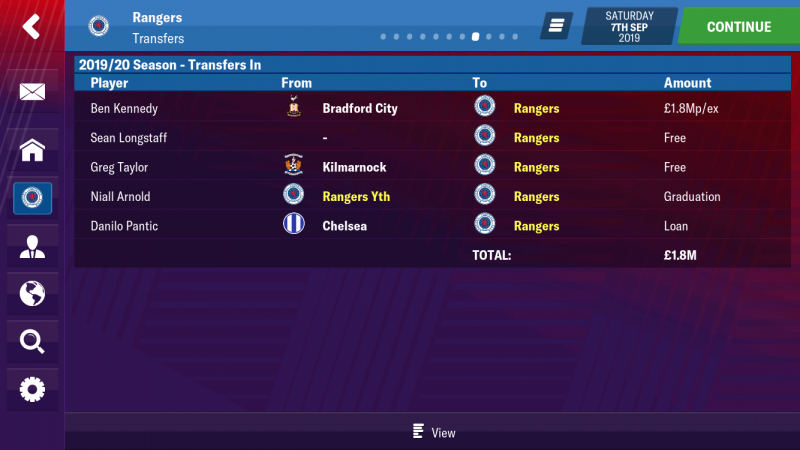 Four players come in and they all fit our transfer policy. 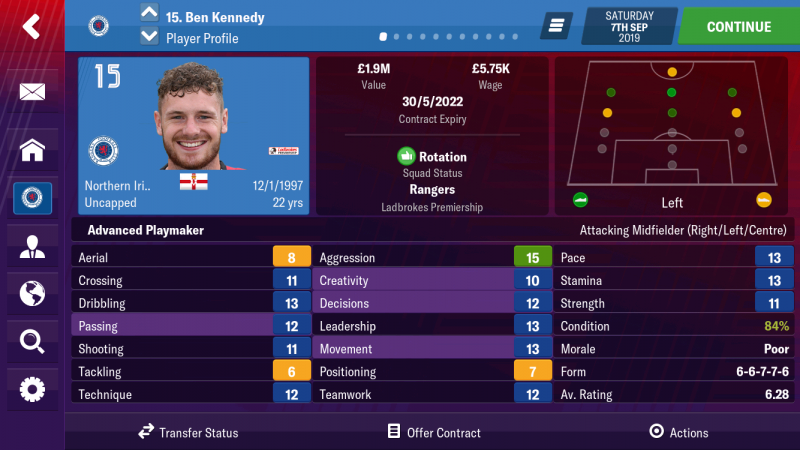 Ben Kennedy is our highest aquasition, joining from Bradford for 1.8 million. 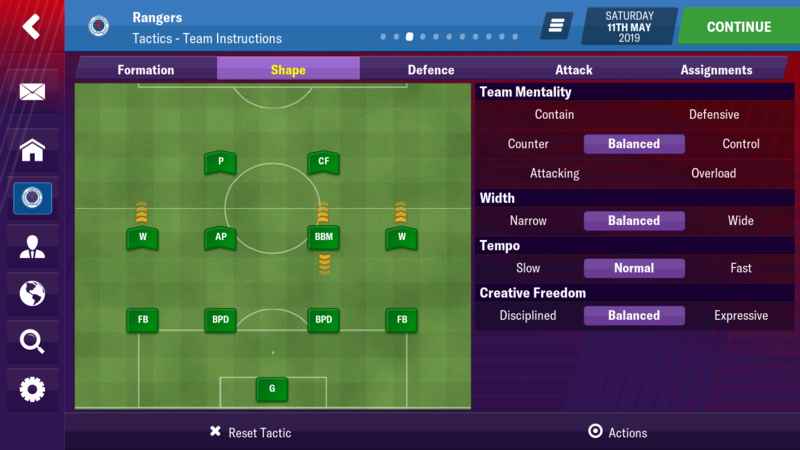 He can play across four different positions in my tactic, I like to have some utility players. 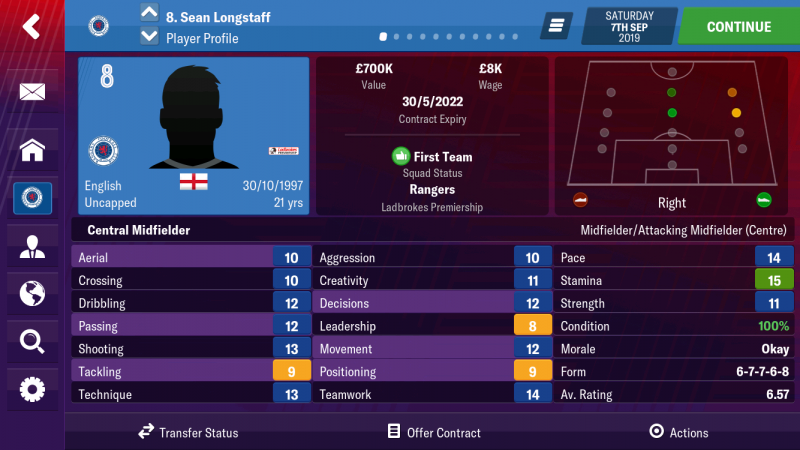 Sean Longstaff is someone Rangers have been linked with, in real life. He comes in on a free transfer. There’s no risk to this signing, he either becomes a key player for us or gets sold on for a profit. Players like Sean will always have other clubs interested. Greg Taylor was the 3rd best LB in the league. Behind Barasic my main LB and Kieran Tierney at Celtic. 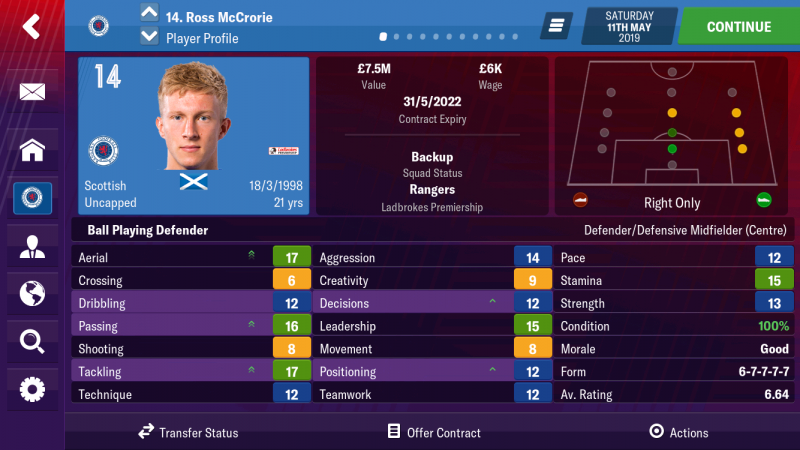 He’s already a Scotland international and at 21 has bags of potential. I expect big things from Greg. Danilo Pantic is an exceptional talent. He joins on loan from Chelsea. 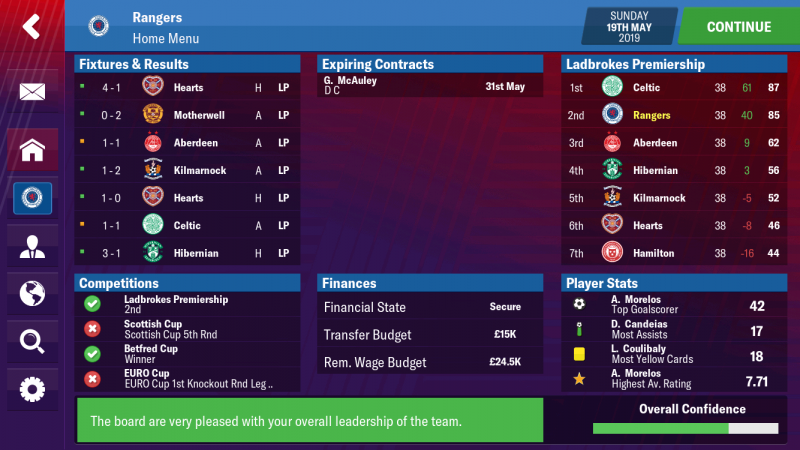 I tried, and failed to land him permanently so couldn’t resist signing him on loan. He adds a bit of Serbian flair. 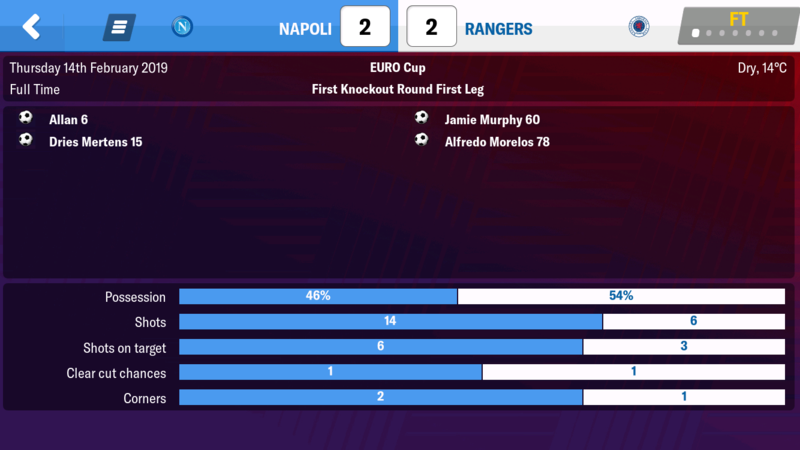 Rossiter had some potential but has never performed for me, on any version of FMM. The rest were never going to be part of my long term plans, I was more than happy to move them on. Great read man. 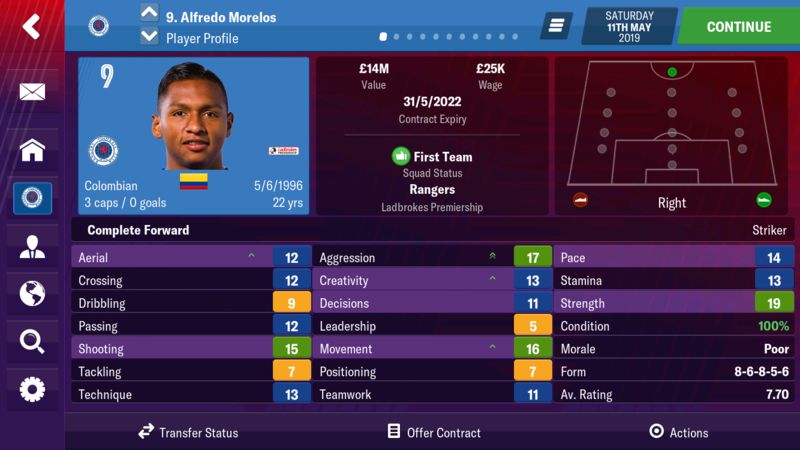 Good luck on the challenges, hope you can keep Morelos on! Definitely following. You would get some shock if someone offered you 40mil plus! Nae bad so far if i was in your shoes as a rangers fan id be sending Sadiq straight back to Roma after his semi final disasterclass ahaha. Keep going you can beat Celtic very early on!